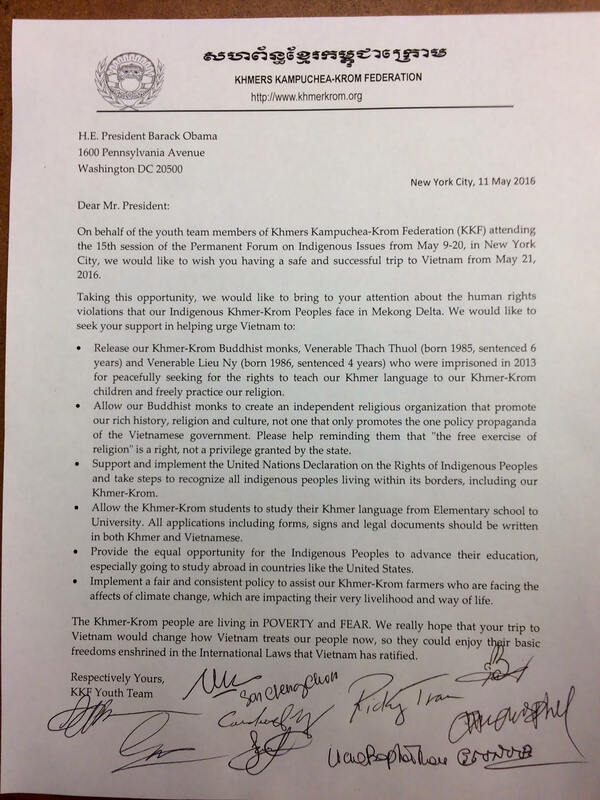 During the first week of the United Nations Permanent Forum on Indigenous Issues, the Khmers Kampuchea-Krom Federation youths drafted a letter to President Obama to highlight Khmer-Krom issues they hope the President could help raise on his visit. Religious persecution and imprisonment of Buddhist monks. Consistencies of government policies to help Khmer-Krom farmers facing hardship from impact of climate change. The Khmer-Krom people live in poverty and fear, the Khmer-Krom youth team hopes that Mr. Obama’s visit to Vietnam can help change how the country treats Khmer-Krom people so that they could enjoy their basic freedoms enshrined in the International Laws that Vietnam has ratified.